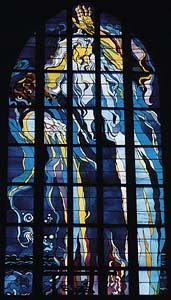 Stanislaw Wyspianski (Polish painter and playwright, 1869-1907), God the Father stained glass window (1897-1902), St Francis Basilica, Cracow, Poland. Larger image. Perhaps the most familiar Christian concept of God is as Father, for God is addressed the Lord's Prayer as "Our Father, who art in heaven...." When we look at Jesus' own terminology, "Father" is by far his most frequent term for God. Let's take some time and examine this metaphor for God as Father. Along with Father and Abba, we'll look at other metaphors of relationship, such as Husband, God of our fathers, God of Abraham, Isaac, and Jacob. Q1. What does the concept of "father" teach us about God, especially the formal way which the word is used in the Old Testament? According to the quote from Otfried Hofius above, which two aspects of a father underlie our understanding of Father in the Old Testament? How should they affect our behavior? That's it, the sum total of the use of Father as a title or metaphor for God in the Old Testament. Notice the relative formality of these references. God is Father of the nation, of the people. I make this point to accentuate how new and different was Jesus' revelation of God as Father -- his Father, Abba, our Father, the Father we can pray to. Also Matthew 5:15; 5:48; 6:1, 14, 26, 32, 7:21; 12:50; 15:13; 16:17; 18:10, 35; 23:9. Interestingly, this phrase appears only in Matthew, with the exception of Luke 11:13 and Mark 11:25. Adding the modifier "heaven" or "heavenly" tends to describe the greatness and awesomeness of the One who is our Father, contrasting greatness with intimacy. But intimacy is one of the hallmarks of the use of Father by Jesus and the early church. Let me explain a simply as I can. But just because it is transliterated only three times doesn't mean than ´abbā´ is only used three times. In Jesus' other prayers it is clear that the Aramaic ´abbā´ underlies the Greek of our New Testament, either directly or indirectly. It is very likely that in all Jesus' teaching about the Father -- "my Father," "your Father," etc. -- that the warm, intimate Aramaic word ´abbā´ was the word Jesus actually used. Jesus introduced us to God as our Father in a way unheard of in the Old Testament or in Judaism. You may be struggling just now. Your relationship with your own father may have been distant, perhaps non-existent. Worse, your own father may have sinned against you through harshness, lovelessness, abandonment, or perhaps even physical or sexual abuse. For sons as well as daughters, coming to terms with our own fathers is essential to our psychological health and maturity, but is sometimes oh so hard, sometimes nearly impossible from a human standpoint. I would guess that father-child relationships were no less hard in Jesus' own time, when some fathers may have assumed it as their legal right to beat on their wives and children -- even more than in our own day. So why does Jesus teach so strongly, so incessantly, about his Father, about our Father? If this metaphor could be rendered useless by human sin, why would Jesus risk it? I would suggest two reasons. First, theologically, the Father-Son metaphor, better than any other, describes the relationship of Jesus to God, and Jesus' own divine nature. Those in our generation who repudiate the Father-Son metaphor tend to drift from a belief in the Trinity towards a peculiar kind of unitarianism. But secondly, I believe that Jesus is trying to heal and bring wholeness to both men and women who have been wounded by their human fathers. Jesus is trying to help you and me know a Father who loves us and will not do us harm, a Father who will not slap us around, but will encircle us in his arms and let us feel his love, a Father who will not let you go. My dear friend, Jesus wants to reintroduce you to his Father, to your Father, so that you might be whole -- spiritually and emotionally. Reclaim your birthright to know and enjoy and love Abba as your Father. Perhaps that is why you are reading this today. Perhaps this will be the frontier of your quest for God over the next few weeks and months. Q2. How was the intimate way that Jesus taught his disciples about God as "Abba" and "Father" different from the Jews' understanding of God as Father? How does God as Abba influence your relationship with him? It is out of the scope of this study to try to summarize Jesus' teaching about his Father. Rather let me just give you a sprinkling of the scores of places where Jesus teaches his disciples about the Father. Occasionally Jesus uses "my Father." Often he tells the disciples of "your Father." There is no difference, of course, between the two. Observe the intimacy of the metaphor of Father. The implications of Jesus' reference to his Father were abundantly clear to his opponents. Jesus' relationship to his Father as Son was unique. Similar is the phrase "our God and Father" (Galatians 1:4; 1 Thessalonians 1:3; 3:11) and "our Lord and Father" (James 3:9, KJV "God, even the Father"). Paul sees unity in "one God and Father of all, who is over all and through all and in all" (Ephesians 4:6). Often we see the phrase "God the Father," sometimes to distinguish him from "Jesus Christ" and sometimes standing alone (Galatians 1:1; Ephesians 5:20; 6:23; Colossians 3:17; 1 Corinthians 15:24; Jude 1), while sometimes "Father" appears alone (2 Corinthians 6:18; Ephesians 3:14). While Paul and Peter tend to modify Father in some way, such as, "God the Father," in John's Letter, "the Father" usually stands alone (1 John 1:21; 2:13, 15-16, 22-23; 3:1; 4:14; 2 John 9). In Revelation, Father is used three times to distinguish between Jesus and the Father (Revelation 1:6; 3:5; 14:1). A number of times we see in a fixed eulogy that begins an epistle the phrase, "the God and Father of our Lord Jesus Christ" (2 Corinthians 1:3; 11:31; Ephesians 1:3; 4:6; Romans 15:6; 1 Peter 1:3; cf. Colossians 1:3). Paul expands this a bit in Ephesians: "... the God of our Lord Jesus Christ, the glorious Father..." (Ephesians 1:17, NIV; KJV "Father of glory"). 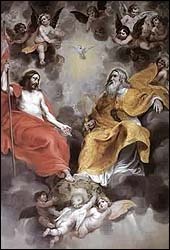 In Revelation we see the phrase, "his God and Father" (Revelation 1:6). "For us there is but one God, the Father, from whom all things came and for whom we live; and there is but one Lord, Jesus Christ, through whom all things came and through whom we live." (1 Corinthians 8:6). Hendrick van Balen, Holy Trinity (1620s), Saint Jacobskerk Antwerp. Son and Father co-reigning with dove above. Larger image. Q3. In what sense are Jesus and the Father one? In what way was Jesus distinct from the Father? Is Jesus God in the sense that the Father is God? Though we don't have time to develop it here, the New Testament is rich in explaining how we can become children of God, "begotten by God" (John 1:10-13), "born again" (John 3:1-8) through believing in Jesus Christ. Through Jesus, we are adopted into God's family as sons and daughters. There are a few other references to God as Father. The phrases "father of," "mother of," "son of," and "daughter of" all are used as a Hebrew idiom to ascribe traits to a person or a people. God is called "the Father of Compassion," (2 Corinthians 1:3), meaning that he is compassionate. He is "Father of glory" (NRSV, KJV, Ephesians 1:17), that is, the "glorious Father" (NIV). Finally, he is called the "Father of lights" (James 1:17, KJV, NRSV) or heavenly lights rather than shadows that change constantly. Finally, Jesus address him as "Holy Father" (John 17:11). In our exploration of family relationships as a metaphor for God, consider another: God our Husband. In the Old Testament several times we see the analogy of God as the Husband and Israel as the wife, who strays and is unfaithful. This passage is filled with anticipation, joy and delight, and God is analogous with the bridegroom. This theme is picked up in the New Testament with the Church as the Bride of Christ, and finds its fulfillment at the great Marriage Supper of the Lamb (Revelation 19:9). Q4. In what sense was God the Husband of Israel? What is the New Testament extension of this metaphor? What causes God to be jealous? I agree with Duck that Father and Son are metaphors of God and that they, as any name, title, metaphor, or descriptor, can lose their impact if used without reflection. But to gut modern Christianity of the Father-Son metaphor runs the serious danger of robbing future generations of the rich, relational understanding of God as Father and Jesus as Son. As mentioned above, father abuse of wives and children was doubtless present in Jesus' day also. Abuse of children by their fathers is a terrible thing, but is a bogus argument for discarding the metaphor of Father and Son. What is really driving Christian feminists like Duck, I think, is a determined assault on what they perceive to be patriarchal social structures. We Christians need to stand against and rebuke male abuses of power, but the pendulum in some denominations has swung so far that it politically incorrect for clergy to address the Father in public prayer, it is politically correct to occasionally throw out the term "God our Mother" to watch traditionalists squirm, and, in a few isolated incidents, churches have sponsored the study and exercise of practices that amount to goddess worship. Jesus compared himself to a mother hen gathering her chicks under her wings (Luke 13:34 = Matthew 23:37). In the Parable of the Lost Coin, Jesus compared the searching God to a woman who swept her house looking for a lost coin (Luke 15:8-10). God is compared to a woman giving birth (Deuteronomy 32:18; Isaiah 42:14), a mother quieting her child on her lap (Psalm 131:2), a woman who can't forget her baby (Isaiah 49:15), and a mother comforting her son (Isaiah 66:13). Clearly, part of the image of God in us humans is the mothering role. But should we make the jump to calling God our Mother? The Bible doesn't do that, though parents have always shared many of the duties of parenting. What sets the father apart from shared parenting are the roles in Jesus' culture of (a) ruling and (b) protecting. Yes, God is our Divine Parent, but as Father, he is more than just a parent. He is our Ruler and Protector. Q5. What do we miss in our understanding of God if we remove the metaphor of Father and Son from our church vocabulary? Which feminine metaphors of God especially help you understand God's nature? As we're examining metaphors and titles of relationships, let's look at "God of your Fathers"
"God also said to Moses, 'Say to the Israelites, "The LORD, the God of your fathers--the God of Abraham, the God of Isaac and the God of Jacob--has sent me to you." This is my name forever, the name by which I am to be remembered from generation to generation. Go, assemble the elders of Israel and say to them, "The LORD, the God of your fathers--the God of Abraham, Isaac and Jacob--appeared to me and said: I have watched over you and have seen what has been done to you in Egypt."'" (Exodus 3:15-16, cf. verse 6). "God of our/your fathers," and often "the LORD, the God of our/your fathers." (Deuteronomy 1:11, 21; 4:1; 6:3; 12:1; 26:7; 27:3; Joshua 18:3 1 Chronicles 12:17; 29:8; 2 Chronicles 13:12; 20:6; 28:9; 29:5; Ezra 7:27; 8:28; 10:11; Acts 5:30; 22:14; 24:14). He is also called the God of Abraham (Genesis 31:42; Psalm 47:9) and once the God of Nahor, in the mouth of Laban, though Laban worshipped the gods of Assyria, not Abraham's God (Genesis 31:53) Sometimes the patriarchs are named together -- the God of Abraham, Isaac, and Jacob (Exodus 3:6; 4:5; 1 Kings 18:36; 2 Chronicles 30:6; Matthew 22:32 = Mark 12:26 = Luke 20:37; Acts 3:13; 7:32), and sometimes singly. God is also known in relation to the nation that serves him. Most of these references are to "the LORD, the God of Israel," approximately 200 times in the Bible. The first example is the name of an altar built by Jacob (also known as Israel): "There he erected an altar and called it El-Elohe-Israel" (Genesis 33:20), that is, "God, the God of Israel." Here are a couple of other examples. Is God ever addressed as "Friend" in Scripture? I wondered when I recalled the line of the song "As the Deer" by Martin Nystrom that goes, "You're my Friend and you are my Brother, even though you are a King...." Several times Abraham is called "the friend of God" (2 Chronicles 20:7; James 2:23). Jesus calls the disciples "friends" (John 15:14-15). In mutual human friendships, at least, each party is free to call the other "friend." It stands to reason, then, that God is our Friend, in the sense that a person might be said to be a "friend of the king" or a "friend of the president." Certainly the metaphor is used in Scripture, but only one way, of us being God's friends. No where is God addressed as "Friend" (except with heavy irony in Jeremiah 3:4). Perhaps that's just accidental. But perhaps it is this way so that we might not presume on God's friendship as a relationship between equals. Perhaps this is the reason that Jesus taught us the friendship and love of God in a metaphor of a greater to a lesser, of a dear Father to a beloved son or daughter. Perhaps this is why Jesus taught us to call God "Abba." Abba, Father. Just as it is sometimes hard for "adult children" to really know their fathers as they long to, there is something in our spirit that longs to know you more intimately. Come and heal us. Come and make us whole as only the knowledge and love of a father can. Abba, Father, we love you. Reveal yourself to each of us with the intensely individual and personal love that we long for. In Jesus' name, we pray. Amen. Many, many praise and worship songs lift up our God our Father. These are just a few. If you have a song in this category to suggest, please let me know (www.joyfulheart.com/contact/). "Be Thou My Vision" ("Thou my great Father, I Thy true son....")words are attributed to Dallan Forgaill, 8th Century, translated by Mary E. Byrne(1905), and versed by Eleanor H. Hull (1912). The tune is of Irish folk origin. "The Lord's Prayer," words and music by Albert Hay Mallotte (©1935, G. Shirmer, Inc.). This is the best known version of the Lord's Prayer. Otfried Hofius, "Father," NIDNTT 1:614-621, especially p. 614. A much more detailed source, more given to a comparative religions approach, is Gottfried Quell and Gottlob Schrenk, patēr, ktl, TDNT 5:945-1022. In Palestinian Judaism of the pre-Christian era, the description of God as Father is also rare, as it is in the Apocrypha and Pseudepigrapha. In Rabbinical Judaism of the first century AD, the name of Father was more widespread, but still far less frequent than other descriptions of God (Hofius, NIDNTT 1:618). Ber. 40a; Sanh. 70b; cf Tg. Isaiah 8:4, as cited by Hofius, NIDNTT 1:614. Hofius (NIDNTT 1:164) cites one cute and quaint reference, not really an exception, from Strack and Billerback I 375, 520. C. K. Barrett, The Second Epistle to the Corinthians (Harper's New Testament Commentaries; Harper & Row, 1973), pp. 58-59. The "and" (kai) in "God and Father" probably has an expository or epexegetical sense, corresponding to the English "namely," or "that is." (Marcus Barth, Ephesians 1-3 (Anchor Bible; Doubleday, 1974), pp. 72-23). Gordon D. Fee, The First Epistle to the Corinthians (The New International Commentary on the New Testament; Eerdmans, 1987), p. 375. He says, "Although Paul does not here call Christ God, the formula is so constructed that only the most obdurate would deny its Trinitarian implications." The NIV margin notes that "I was husband to" is the Hebrew text. The Septuagint and Syriac texts put it "and I turned away from." Elmer A. Martens, bā`al, TWOT 262a. "The name of the land, Beulah (passive participle of), signifies both the intimacy and the joy of YHWH in conjunction with the land." Leonard J. Coppes, "qānā´," TWOT #2038b. Chalice Hymnal (Chalice Press, 1995), #47. Ruth C. Duck, Gender and the Name of God: The Trinitarian Baptismal Formula (Pilgrim Press, 1991), p. 4. In heaven, where there is no marriage or giving in marriage (Matthew 22:30), gender apparently loses it function and meaning. Merriam-Webster's Collegiate Dictionary (11th edition; Merriam Webster, 2004).